There is still a lot of sea ice in Hudson Bay, Foxe Basin, Davis Strait and Baffin Bay this week – more than average for this date – with slightly less than average in the Beaufort Sea. Past behaviour of Western and Southern Hudson Bay polar bears suggests the mean date that bears come ashore for the summer this year will be later than average due to the plentiful ice available, regardless of when polar bear biologists decide that “breakup” has occurred. Hudson Bay, with almost 50% of the bay still covered in ice, has the third highest coverage this week since 1992 (after 2009 and 2004); Davis Strait has the highest coverage since 1992; and Foxe Basin and Baffin Bay have the highest coverage since 1998. 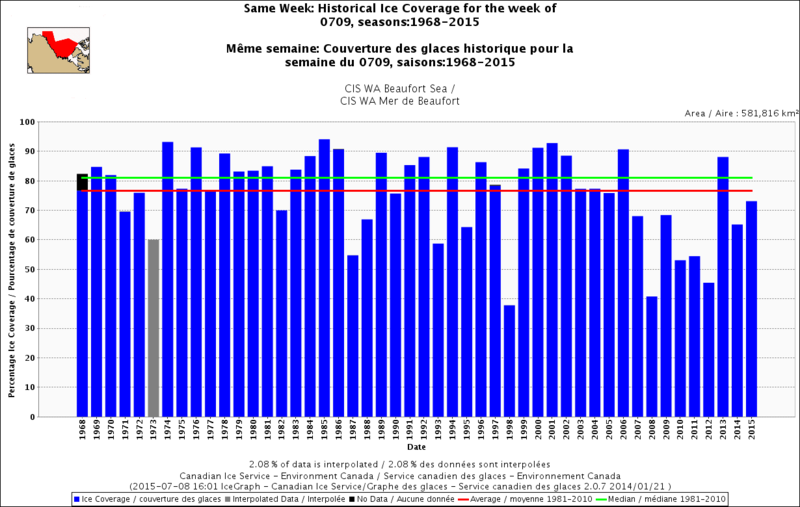 For this week, the Beaufort Sea has the second highest coverage since 2006 (after 2013), and more ice than was present in 1971, 1982, 1987, 1988 and 1998 – among others. Published data shows that most polar bears of Western Hudson Bay traditionally come ashore in July, but this year it might be late July or even August. Have a look at the charts below. Figure 1. 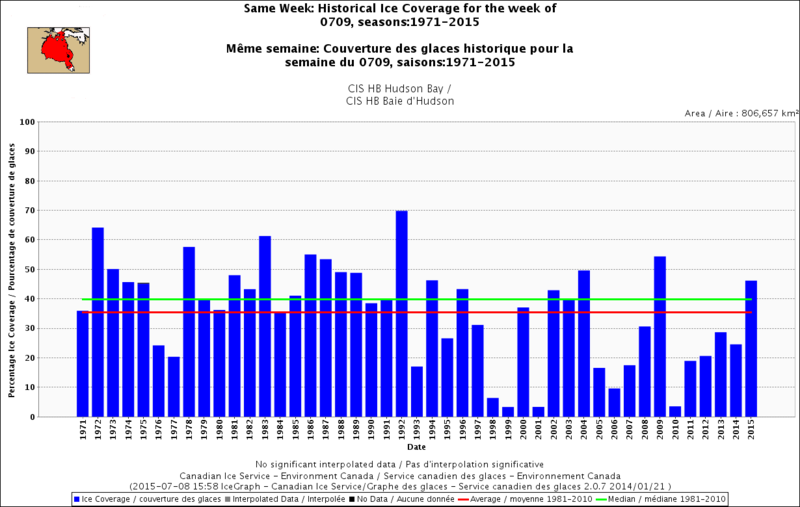 Hudson Bay ice coverage for the week 9 July, 1971-2015. CIS. Click to enlarge. Figure 2. 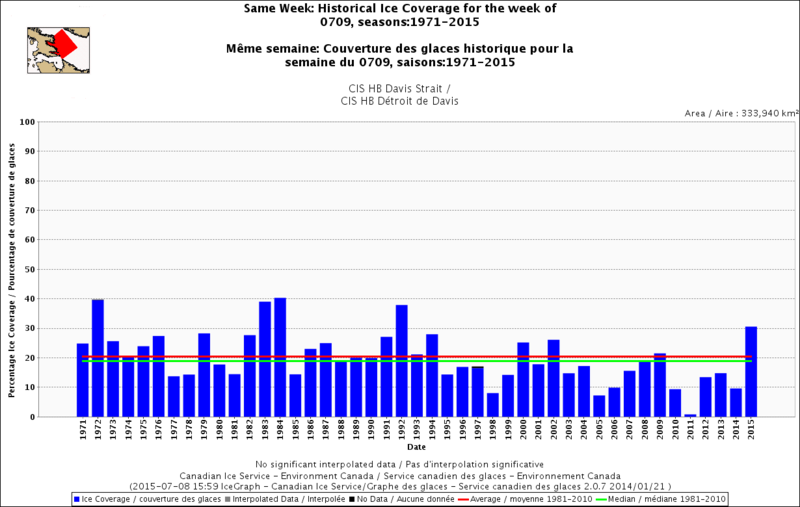 Davis Strain ice coverage for the week 9 July, 1971-2015. CIS. Click to enlarge. Figure 3. 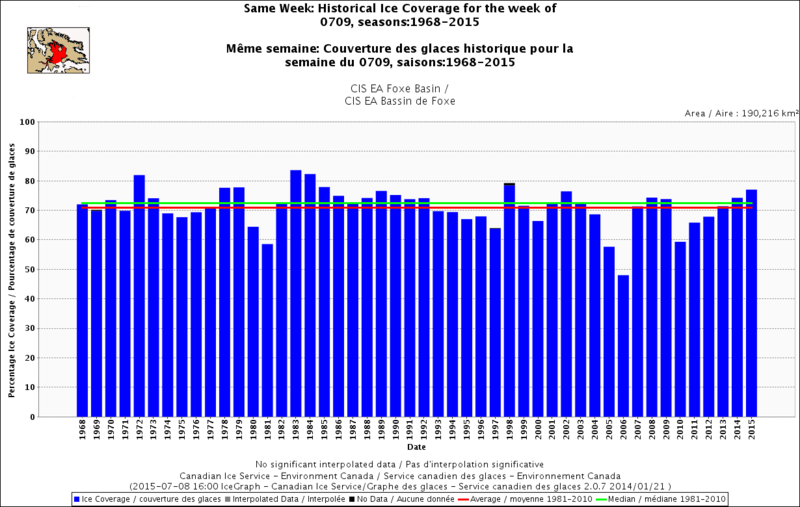 Foxe Basin ice coverage for the week 9 July, 1968-2015. CIS. Click to enlarge. Figure 4. 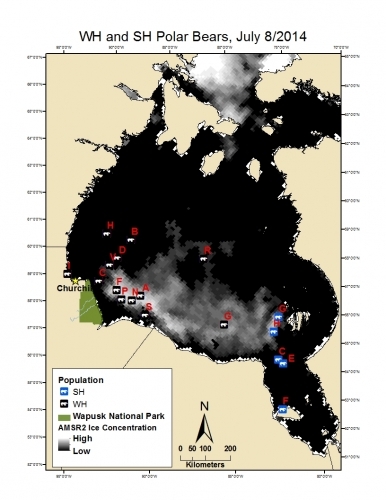 Baffin Bay ice coverage for the week 9 July, 1968-2015. CIS. Click to enlarge. Figure 5. 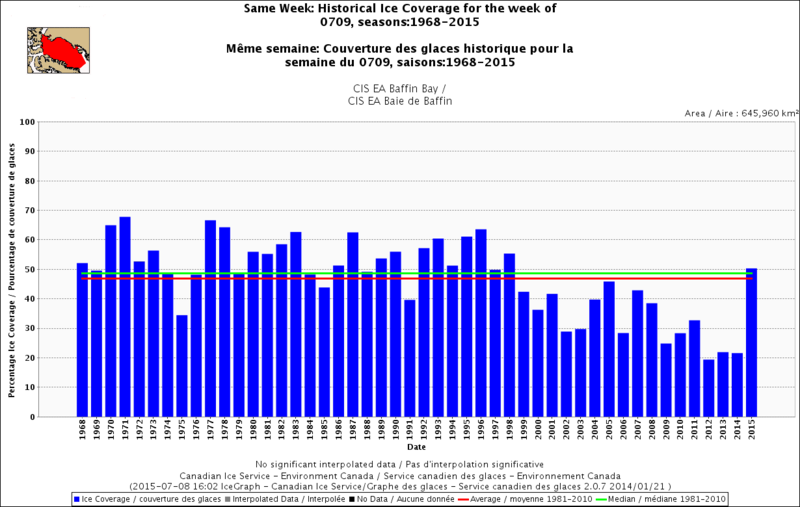 Beaufort Sea ice coverage for the week 9 July, 1968-2015. CIS. Click to enlarge. Polar bear biologist (University of Alberta) Andrew Derocher, via twitter (Fig. 6), said that by 6 July, 2 out of 9 collared WHB females were onshore, which means most of them are still out on the ice. Figure 6. Tweet from Andrew Derocher noting 2 out of 9 collared WHB females were onshore on 6 July 2015. Click to enlarge. That’s a bold statement given that there are no published data I’ve found that contain precise dates for the arrival of the first bears of the season onshore – for the 1980s or any other year. There are mean dates for when bears were onshore for 1991-2009, with some missing data (Cherry et al. 2013:5; Stirling et al. 1999: 299), but nothing about when the first and/or last bears came ashore any year. Stirling et al. (1999:299) showed that the earliest of all mean dates of arrival onshore for collared polar bears between 1991 and 1998 was 24 July. For previous decades, Stirling and colleagues (1977:42) noted that between 1966 and 1975, polar bears arrived onshore in “July” (no precise records were kept, I guess they didn’t think it mattered). However, there are no published data on mean dates ashore for the 1980s either, let alone dates when the first bears of the season arrived onshore. Last year, even though there appeared to be little ice on the bay, most WHB and SHB females were still out on the ice on 8 July. 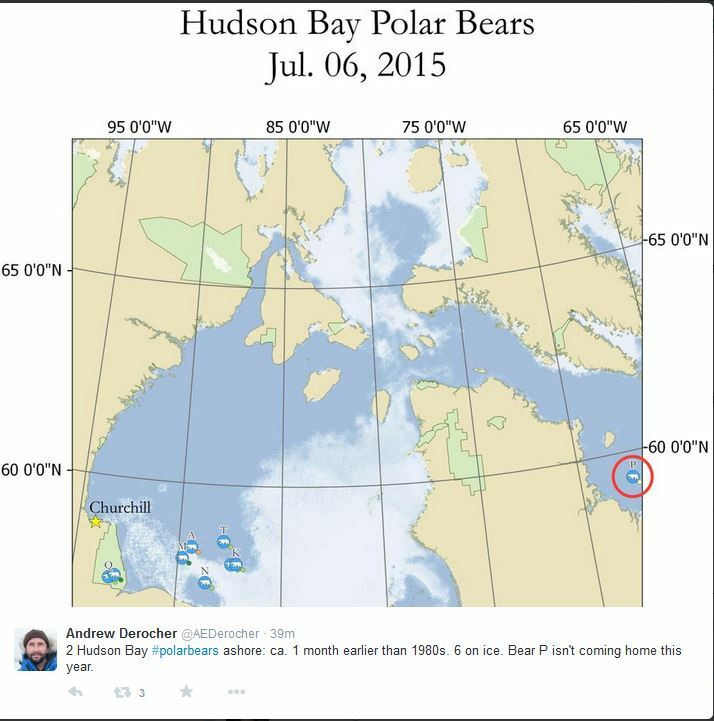 That suggests to me it will be late July or even August before the last of WHB and SHB bears are ashore. See previous discussion here. Figure 7. Positions of Western and Southern Hudson Bay females with collars, on remnant ice at 8 July. Courtesy Polar Bears International. This entry was posted in Sea ice habitat and tagged baffin bay, Beaufort Sea, breakup, Davis Strait, Derocher, females, Foxe Basin, Hudson Bay, ice coverage, leaving the ice, onshore, polar bear, polar bear science, sea ice, summer. Bookmark the permalink.